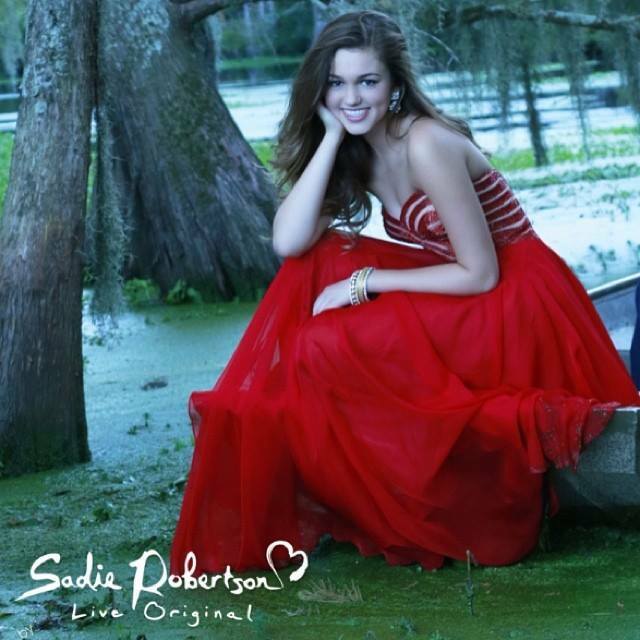 Sadie Robertson, daughter of Duck Dynasty stars Willie and Korie Robertson, posted on Facebook a picture of herself wearing a red dress from Sherri Hill line of prom dresses in the Louisiana swamp. The prom dress, including ones that Sadie Robertson modeled in at the Sherri Hill’s New York Fashion Week on September 9th, is part of her effort to create a clothing line that promotes modesty, a biblical value and a matter of heart that are increasingly unfamiliar in today’s fashion trends. Sadie Robertson, 16, has attracted much attention after modeling in the prom dresses that received her father Willie Robertson’s approval at fashion show in New York, where the entire Robertson clan attended the event to show their support. She teamed up with popular design for young women’s formal wear to create the “Sadie Robertson Live Original by Sherri Hill” collection. While the gowns are designed by Sherri Hill, Sadie Robertson would choose which dresses she wanted as part of her modest clothing line. The prom dresses collection will be available in the spring of 2014.